Rich snippet helps to Google and other search engines to provide more relevant information about the content of webpage. Rich snippet is HTML code that is placed on a webpage to increase your website listing in search engine result page. By adding rich snippet code into your webpage, you can enhance, your website visibility in search engine. Rich snippet generator tool generates multiple numbers of Rich snippets and Microdata codes that can be saved in different txt for your various websites. With rich snippet maker program, you can easily generate Google compatible microdata code that helps you to grow traffic towards your website. With the help of rich snippet generator program, you can make your products as well as services more accessible for search engine by adding rich data snippet about your business, organization, products, Events, Review, Movie and Book. Using our Rich Snippet Generator - Professional Software, you can create search engine friendly rich snippets and Microdata code to add structured data into your web pages. By adding rich snippet code into your website, you can drive more traffic towards your website. » Rich snippet generator software easily generates Microdata and Rich Snippets codes for different websites instantly. » Rich snippet generating program is developed with batch processing process to create rich snippet as well as Microdata code. » Software helps you to enhance your website listing in Yahoo, Google, MSN, Bing and other search engine. 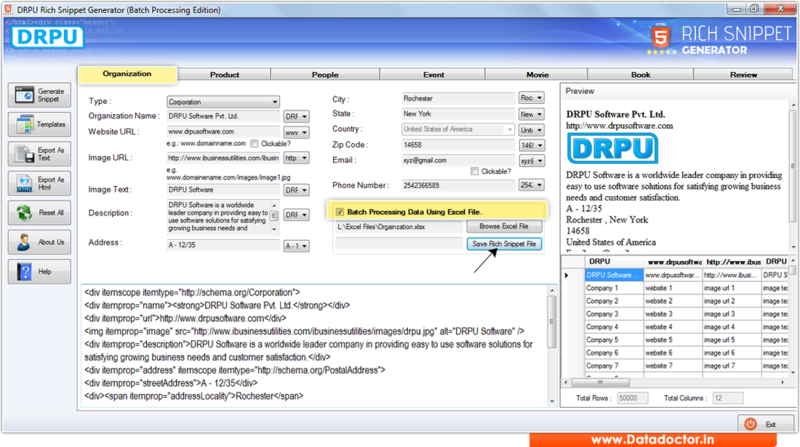 » Rich snippet maker program provides facility to export code in html or txt file format as per your need.